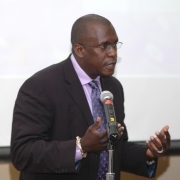 Chief Economic advisor Dr Patrick Antoine said that Trinidad has given a commitment to take concrete steps towards solving its restriction on Grenada’s honey entering that market. During last week thirty-sixth meeting of the Council for Trade and Economic Development (COTED) which was held in Guyana, Grenada made a submission entitled “Confiscation of Honey exported to Trinidad and Tobago”, and this item was one of the main discussion points of the meeting. Dr Antoine said on Tuesday that following the submission Trinidad gave 30 days to look into the matter and take the necessary measures. “However, if nothing is done so that we can export to that market, we will be taking our concerns to a higher body,” he said. Trinidad is using a law which dates back the 1964 to protect honey produce in Trinidad. Although it has not presented any evidence the representatives from the island are claiming that it’s taking proactive measure to ensure that no disease imported through the natural product of the bees.